Home > News > PhD thesis Lotte Krabbenborg on Involvement of civil society actors in nanotechnology. PhD thesis Lotte Krabbenborg on Involvement of civil society actors in nanotechnology. More productive interactions between technology developers and civil society actors are needed to align nanotechnology developments with societal needs. 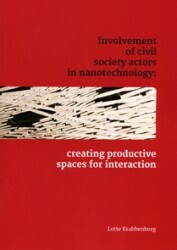 That is the central argument of the PhD-thesis: “Involvement of civil society actors in nanotechnology – Creating productive spaces for interaction” by Lotte Krabbenborg, who defended her thesis on 29 November 2013 at Groningen University. The thesis analyses spaces for interaction between nanotechnology developers and civil society. The research outcomes contain some lessons for the engagement activities within NanoDiode. Dr Krabbenborg notes that industry-CSO collaborations should be more than symbolic exercises. Indeed, she identifies several co-construction projects – projects in which technology developers and civil society actors work together on products – that succeeded in articulating the roles and responsibilities of industry and CSOs in addressing the challenges of nanotechnology. These include the three-year partnership between DuPont and the Environmental Defense Fund and the DialogForum Nano organized by the chemical company BASF. Dr Krabbenborg als studied the formation and interaction processes in NanoCap, a capacity-building project for CSOs funded through the Science and Society Programme in the European Commission’s 6th Framework Programme for Research (www.nanocap.eu). Responding to calls from the European Commission for more direct involvement of civil society organizations in political decision-making and in early stages of technological development, NanoCap aimed to build capacities of environmental organizations and trade unions to enable their participation in policy debates on nanotechnology. The main conclusion is that: “There is a need to do better in aligning science and technology developments with societal needs and issues, and to make more reflexive (more informed, more encompassing) decisions in the present. The way to pursue this goal is to have more productive interaction between developers and promoters of new science and technology and civil society, and spaces for deliberation are important for this to occur.” Dr Krabbenborg’s thesis thereby sets a challenge for NanoDiode and endorses its main objectives: to realise such spaces for deliberation in the ongoing political decision-making processes that constitute nanotechnology governance. Dr Krabbenborg’s thesis: Involvement of civil society actors – Creating productive spaces for interaction (last accessed 12 Dec 2013).